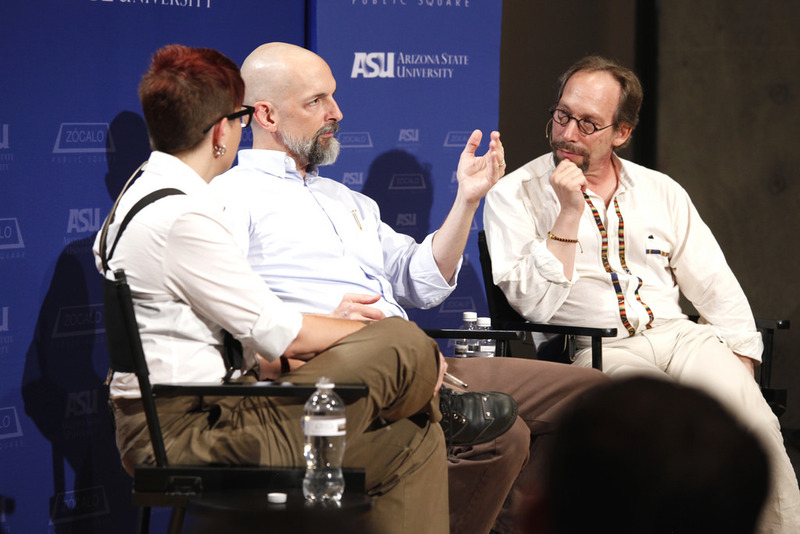 What happens when you bring together scientists and science fiction writers? 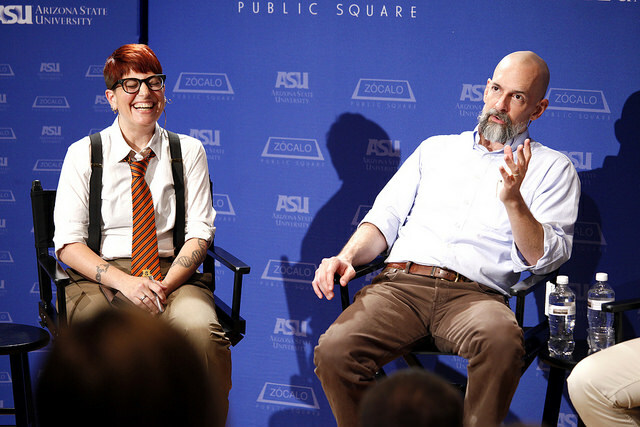 Zócalo and the Arizona State University Center for Science and the Imagination brought physicist Lawrence M. Krauss and science fiction writer Neal Stephenson together on stage to find out. That question is also at the heart of a new book, Hieroglyph: Stories and Visions for a Better Future, to which both Stephenson and Krauss contributed. 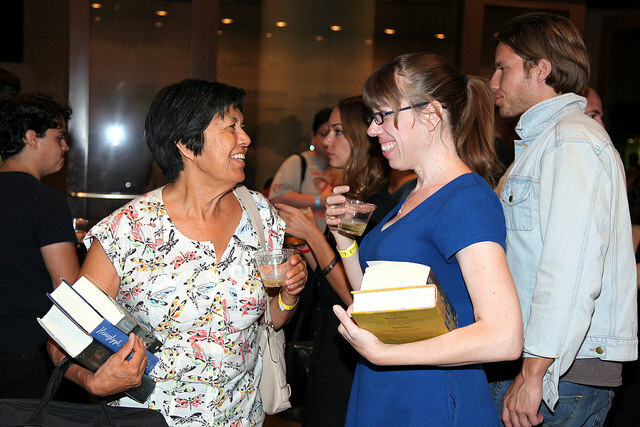 Annalee Newitz, editor-in-chief of io9, the evening’s moderator, and a fellow Hieroglyph contributor, opened the discussion—in front of a standing-room-only crowd at MOCA Grand Avenue, with more people watching in a nearby simulcast room—by asking how the relationship between writers and scientists plays out. Does the science fiction writer invent something that the scientist then builds? Not exactly. 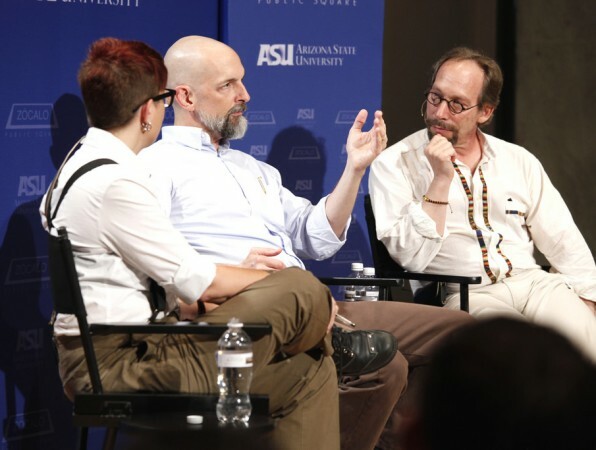 Stephenson said that he originally brought a more modest view to the question of the utility science fiction offers to science: that people who read science fiction might be inspired to grow up and become scientists. However, a conversation with Arizona State University President Michael M. Crow pushed the idea further. 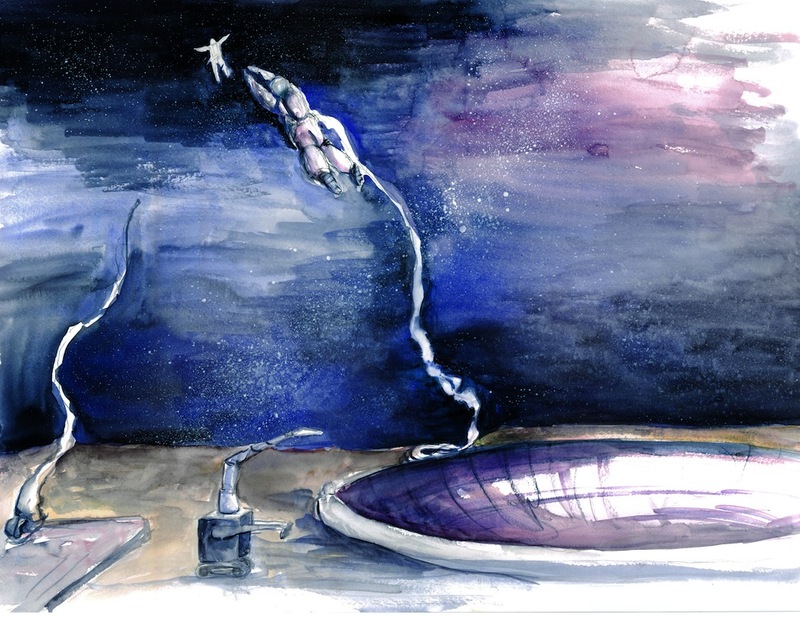 Can science fiction writers, asked Crow, create interesting projects for scientists to work on? Stephenson said that anecdotally, he had heard of teams of engineers reading a work of science fiction together for motivation. Typically, engineers work on narrow tasks in individual cubicles, and are pulled together for tedious meetings and PowerPoint presentations. 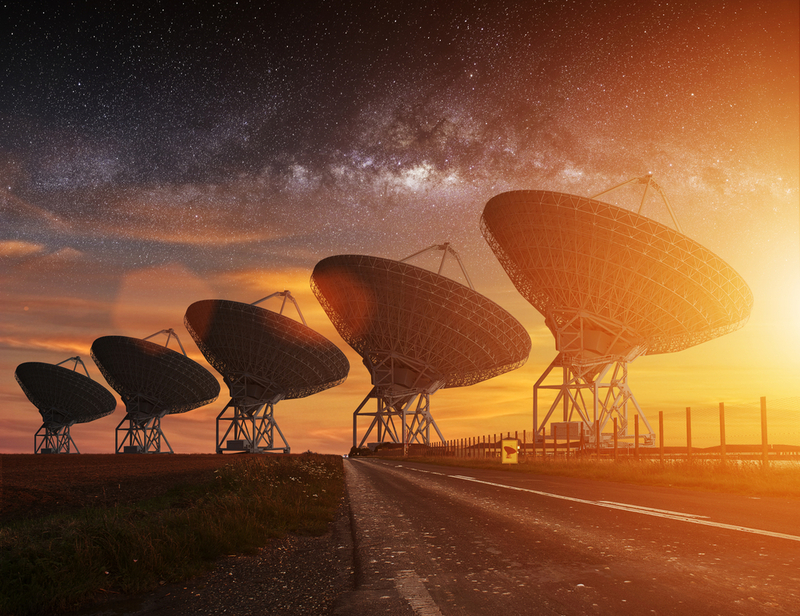 But an iconic idea that engineers could all agree on—of the sort found in science fiction—just might cut down on some of those meetings and inspire everyone to work toward the same end. 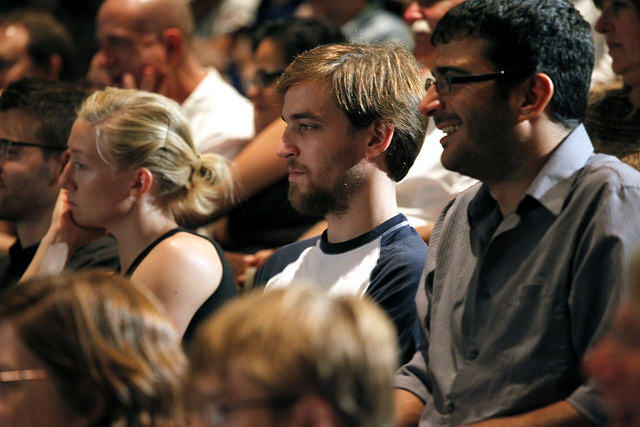 Newitz asked Krauss how his writing—science nonfiction—plays a different role in educating the public than science fiction. “My job,” said Krauss, “is to inspire people.” It’s not about educating them about what’s possible—“we tend to value the technology produced by science far too much,” he said. Rather, “it’s the ideas of science that are what’s inspiring,” he said. 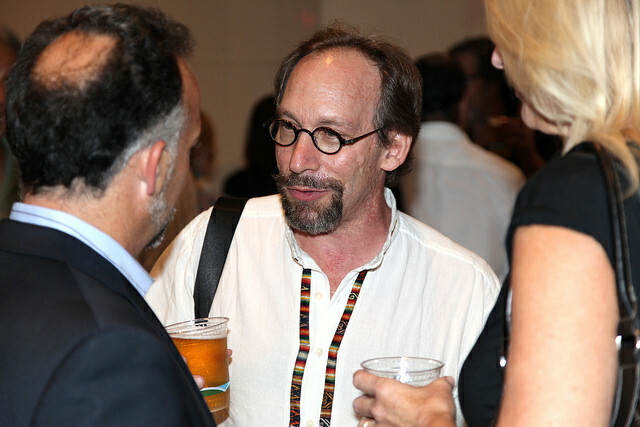 Krauss believes that science inspires science fiction much more than vice versa. That was certainly true of Stephenson’s contribution to Hieroglyph, a story about constructing a 20-kilometer-high tower out of steel. In reading scientific papers by Geoffrey Landis of NASA, Stephenson learned that plain old steel was strong enough to build bigger, grander structures than anything in existence. What was lacking was human vision. Krauss cautioned that vision isn’t the only thing standing in the way of scientific development: “It’s usually just money,” he said. The National Science Foundation’s yearly budget is under $8 billion—less than what Americans spend each year on potato chips. Hieroglyph takes a more optimistic view of the future of science than the dystopian literature that’s currently in fashion. Newitz asked whether dystopian science fiction might better prepare us for our future, particularly if science funding is secondary to potato chips. Krauss spoke disparagingly of pessimism in science as well as science fiction. Many scientists, he said, don’t want to work on anything but global warming, because they think everything else is futile. But optimism is essential to discovery; you never know what’s going to succeed until you try, and “optimism is what breeds the trying,” he said. Stephenson added that optimism doesn’t mean pretending politics don’t exist. One story in the anthology, for example, involves people using software to figure out more efficient ways of working toward political consensus. There are many instances, however, where science fiction doesn’t get the science right. Hackers have a great deal of appeal to writers, said Stephenson, because they’re “ragtag outsider types intrepidly patching things together.” It makes for an appealing story, but most innovation happens not from one person but from a group in a big company or lab or government facility. Newitz asked if there’s anything science fiction writers can do to inspire more diverse people to participate in science in the future. “It’s a fine line,” said Stephenson: “You don’t want to engage in tokenism for its own sake, because people see through that.” Instead, you have to write “in such a way that someone who’s not the classic white, male, straight engineer can feel welcomed into the world,” he said. 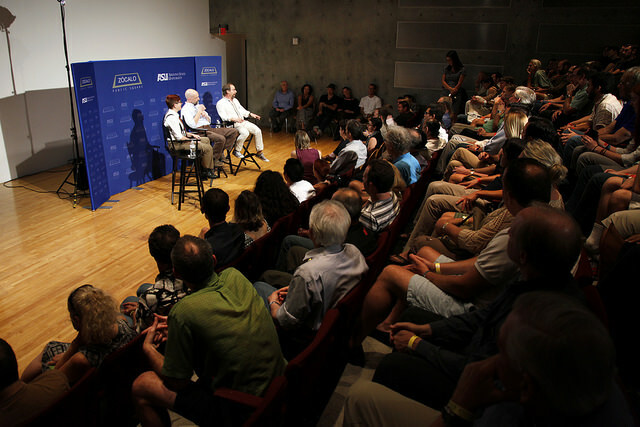 In the question-and-answer session, the panelists were asked to speak more about their optimism about the future and at the role of politics in science. The world is getting better, said Stephenson—and that’s largely because of science and technology. We’re hardwired to think things are getting worse, said Krauss, but the truth is that most people are living better lives than ever before. Newitz added that Hieroglyph is one way of responding to dystopian stories and visions. We tell ourselves the world is getting worse—“and we aren’t telling stories about how it’s getting better in a compelling way,” she said. Another audience member asked if the book would have been designed differently had it been written not to inspire a new generation of scientists but to inspire the people who make laws and write checks that affect how science is done in America. “They’re people too,” said Newitz. She hopes that maybe the book will help inspire scientifically minded people to go into politics. “Science is easier,” said Krauss.